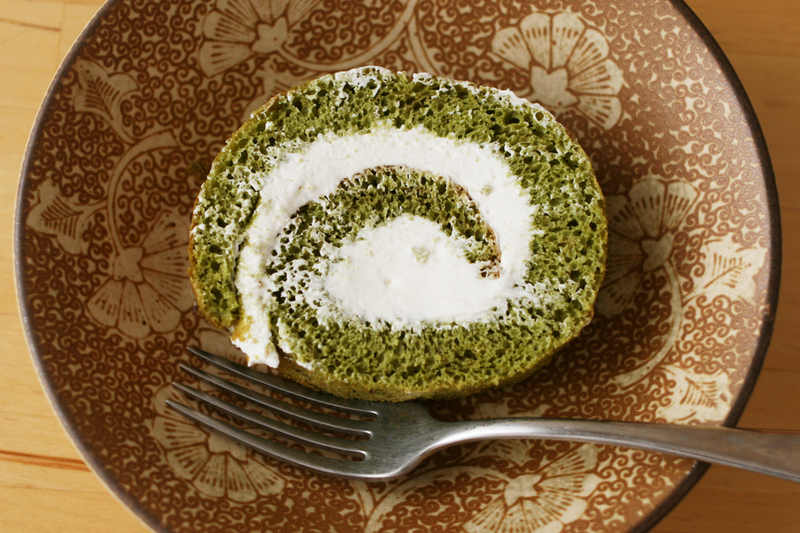 To change things up, I baked this Matcha Roll Cake. I don’t post many sweets, but my friend Christy very casually made a similar cake and thought it was one of those easy, but impressive desserts. Impressive—yes. Light, airy, and delicious—yes. But it took me a few tries to get it right. Each time I learned something new, so now I can make it with a smidgen of confidence. Hopefully with some of my tips, you’ll have no problem at all. My mom used to buy a coffee roll cake from a Chinese bakery (or was it the bakery section at 99 Ranch?) when I was in high school. We loved that it wasn’t too sweet and—since there’s no butter or oil—it didn’t feel rich or greasy. Even though it’s light, the danger is you could probably eat more than one slice. Hope you show more restraint than I do! Preheat the oven to 350ºF. Line a jelly roll pan or rimmed cookie sheet with parchment paper and let the excess paper hang over the sides. I usually crease the edges at the bottom edge so the paper will lay flat. 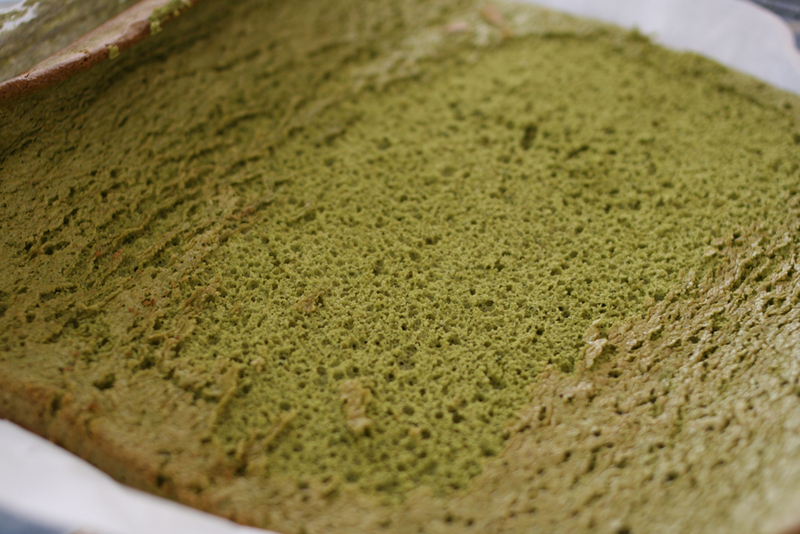 Sift the flour, matcha, and baking powder 3 times (I don’t have a sifter so I used a sieve over a bowl and sifted it 3 times that way). Beat the egg whites with a stand mixer or electric hand mixer until stiff peaks form, but not dry. This is important because if you beat them until dry, it will be more difficult to incorporate into the batter, the batter will be too thick, and bake tough. Keep a close eye on it and check often when you think it’s close. In another bowl, beat the egg yolks until they lighten in color. Add the sugar and beat again until light. Next, add the milk and beat until combined. Stir in the flour mixture. I usually stir slowly with the mixer until almost incorporated, then do the rest by hand with a rubber spatula so I don’t over mix. 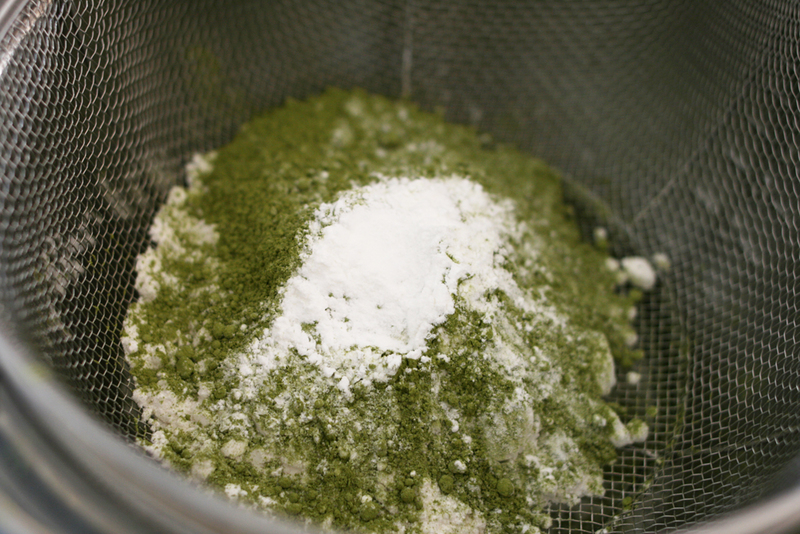 Patiently and gently fold in 1/3 of the egg whites until incorporated into the matcha batter. Fold in another 1/3 until no whites remain. Then fold in the last 1/3. Incorporating a little at a time helps keep the batter light, as long as you don’t over mix. Pour the batter onto the pan and smooth out the top and roughly shape into a rectangle with an off set spatula (I don’t have one so just used a rubber spatula). The batter will be loose and won’t extend all the way to the edges. Bake until the edges are slightly brown and the center is dry to the touch (about 15–20 mins). 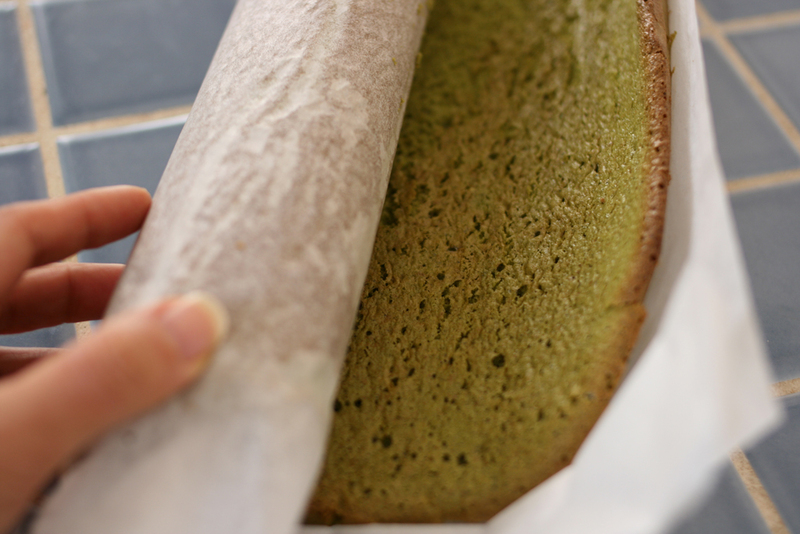 Remove from the oven and when cool enough to handle, roll the cake—with the parchment—from the short side. Let sit on a rack to cool completely. Cooling it this way will prevent your cake from cracking and breaking when you re-roll with the whipped cream. When cake has cooled, beat the heavy cream and sugar until stiff, but smooth. Unroll the cake and spread the whipped cream evenly over the surface. Use your best judgement and use as much whipped cream as you need. I made the mistake of dumping everything on and—because the dimensions of my cake were smaller that time—it was way too much whipped cream. Carefully roll the cake, releasing it from the parchment as you go. You might lose pieces of the cake so be as careful as you can. Once rolled, wrap it tightly back in the parchment and wrap the whole thing in plastic wrap. Keep in the refrigerator for at least 2 hours. When ready to serve, trim the ends and cut into 1-inch sections. 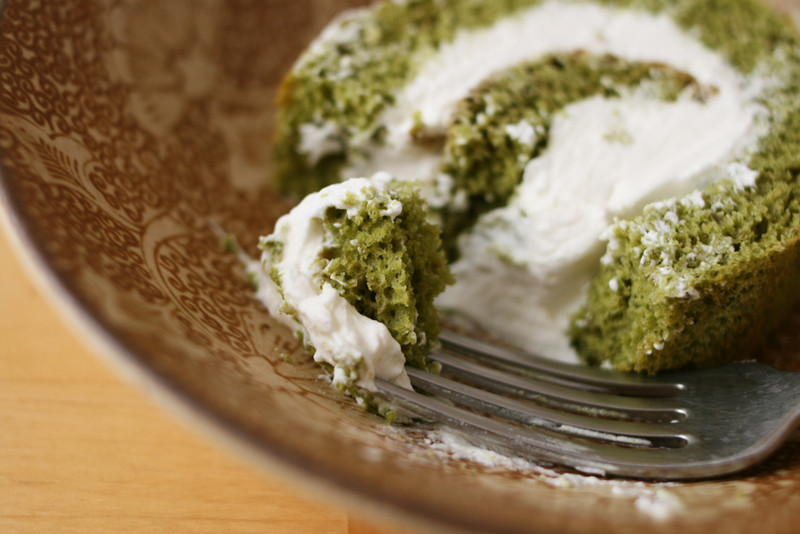 This entry was posted in Contemporary Recipes, Favorites, Sweets and tagged cake flour, dessert, eggs, matcha, sugar, whipped cream. Bookmark the permalink. Post a comment or leave a trackback: Trackback URL. This looks so yummy! This is probably a silly question but how big should the rimmed cookie sheet be? kasey, that’s actually an important point. I used a standard half-sheet baking pan, which I believe is about 12×18 inches. Strange… Somehow my comment has disappeared, so I will try once more! This roll cake is a real beauty! 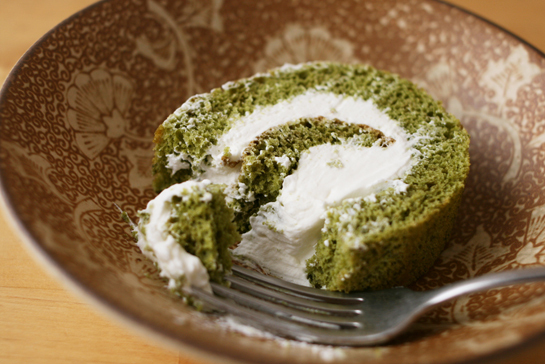 I am impressed by your dexterity and baking skills: I have never even tried making a rolled cake… I know it is very difficult, so congratulations! Of course, as a matcha fan I find this bright green colour particularly attractive. Sissi, you wouldn’t be so impressed if you saw how the first couple tries came out! But I was very pleased when I got the hang of it. Hope you have a chance to try it—it’s so yummy! Would this work with all-purpose flour or is cake flour a must? I don’t have it easily available but would love to make this! Tina, cake flour gives the cake a light and airy texture, so AP flour will make it a bit more dense. Give it a try and let me know how it turns out! I used 75g AP flour+15g cornstarch(together 3/4 cup) to make my own cake flour. It turned out delicious! Thanks for the recipe. Tina, glad it worked out! I’ll have to try that flour/cornstarch combo next time. Should I be using the same amount of Cake Flour if I decide not to use AP flour? Shins k, this recipe uses cake flour so it should be fine. If you want to use AP flour, the cake might be more sturdy and have a chance of breaking when rolling. That’s just my guess, though. Let me know how it goes!